A New York classic! 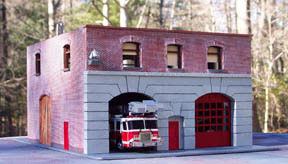 This model is based on a Manhattan firehouse. It is resin cast with laser-cut basswood doors. The roof is remavable. Footprint: 6 3/8"l x 6 3/8"w.